At Safety Scan, our team is committed to providing customized, durable, and reliable gas detection solutions for the modern age and beyond. That’s why we partnered with Blackline Safety to become an authorized distributor of the G7 wireless portable gas detector, which is sure to outlast and outperform any other device in the same realm. With the G7, you get the future of smart gas detection — with customizable gas sensors and configurations, 3G cellular communication capability, GPS location tracking, and live connections to safety monitoring personnel. What’s more, the modular design of the G7 allows it to be the world’s first and most innovative employee-worn gas detector, easily transportable and responsive no matter the environment. But don’t’ mistake the G7’s size for a lack of toughness. 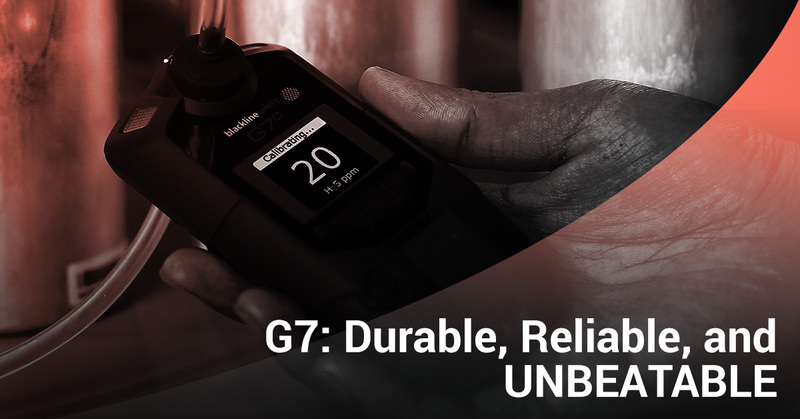 Keep reading to learn why the G7 is the most durable, reliable, and unbeatable wireless gas detector and contact Safety Scan today to request a free demonstration at your facility. The G7 line of wireless gas detectors is built to hold up to the most hostile environments. No matter where the G7 goes, you can count on it to provide advanced safety, protection, and constant communication between lone workers in remote areas, supervisors, and live monitoring support in case of an emergency or gas leak event. You can count on the G7 to hold up to tough conditions at all times, with a functional operating temperature range between -4 degrees and 131 degrees Fahrenheit — essential for those lone workers in potentially hostile environments like gas pipelines, oil refineries, mines, and sewage treatment plants. The G7 comes standard with a two-year warranty, with a rechargeable lithium ion battery built to last for up to 18 hours of continuous operation. With features like this, it’s no wonder that the G7 is known as the future of wireless gas detectors. Along with its toughness and convenience, the G7 is designed to be the ultimate safety net for lone workers in remote, potentially hostile locations. These portable gas detection devices are capable of sensing single and multiple gases, depending on the model and cartridge capabilities you chose, and allows for wireless connectivity, work-anywhere 3G cellular connectivity, scheduled automatic check-ins with the lone workers, automated no-motion detection, two-way voice and text communication, and more. What makes the G7 more reliable than the competitors is the fact that it has the capability to alert the live safety monitoring team in a matter of seconds in the event of a gas leak, no-motion event, or other emergency — even if the worker can’t. That’s the type of peace of mind you can’t get with any other wireless gas detectors. These features provide assurance that your lone workers are covered no matter what. The G7 has the capability to ensure that even trace amounts of toxic gases will be immediately detected, with multiple alerts getting sent immediately to supervisors and other staff on site. In the event of an emergency or downed worker, the G7 will alert the live support staff and point them to the exact location of the situation in a matter of seconds. This streamlines the response process and ultimately saves lives. If you want to see the G7 in action for yourself, just contact the Safety Scan USA team and request a free demonstration at your facility today.